Football betting strategies — can they be foolproof or is it a MYTH? Since the material is too large for one article, some strategies have been reviewed in other articles which we will provide links to here. This is perhaps the most important part of the article that arouses most interest. Let me say this right away — in my opinion, there is no such thing as a 100% winning football betting strategy. Otherwise bookmakers would turn into charity organizations who make money out of thin air and give it away to everyone. At the same time, I think it is possible to single out some strategies that may be more successful and profitable than others, and that, when used wisely, can help you stay in the black. In this article, all the strategies will be reviewed in detail on examples. Enjoy! Arbitrage betting is one of the most widely used notions in the world of betting. Follow the link to learn how to find and use arbs, as well as about the ins and outs of this tricky business. Click on the link below to find about the theory of losing to bookmakers and how value bets can save you from draining your bankroll. This strategy can be used not only in football. The idea is to increase the bet amount after every loss. Read more about the system as well as its advanced variations — limited and double martingale — in the article: The Martingale Strategy: Improved Variations and Calculator. The article Total Bets in Football describes several strategies, including a ‘live’ one, as well as interesting patterns that can help you predict match results. In the article Live Betting Strategies in Football we reviewed several live strategies at once and provided practical examples. To learn about accumulator bets, including live ones, as well as about system bets that allow cautious punters to bet with minimal risks, read the article Accumulator and System Bets in Examples. Betting on pools is a special type of betting where bookmakers choose events for you. To learn about how to use pools to your benefit, read the article The Strategies of Betting on Football Pools. Despite similar names, the “2 of 3” betting strategy has nothing to do with “2 of 3” system bets. While the latter suggests placing a number of accas, here we deal with single bets. In a nutshell, the idea of the strategy is the following: You make three single bets on the outcomes of football matches with odds no less than 1.51. The bet amounts for all the three bets are the same. To earn profit, you need two out of your three bets to win. Double win bets, sometimes called ‘chains’, may be combined in series, e.g., a 30-bet series is formed of 10 chains with three events in each. The strategy, which is in fact a variation of flat betting, is suitable for beginners. The strategy is based on the ‘goal in the first 15 minutes’ type of bet. 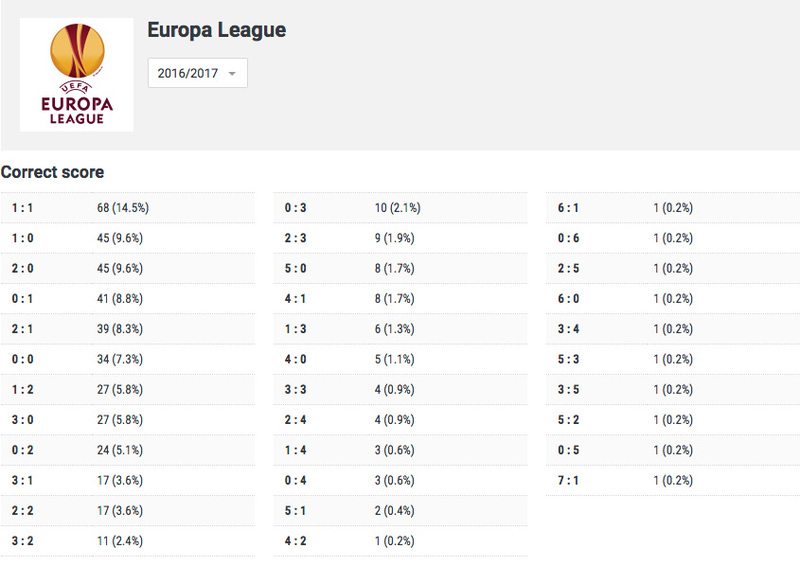 According to the statistics of the Champions League and Europa League matches presented at the official UEFA website, about 10% of total goals are scored in the first 15 minutes of a match. The reason for this is that in the beginning of the game opponents try to learn about each other’s weaknesses and therefore play cautiously. The teams should be approximately equal in strength, with no obvious favorite. Do not bet on high-scoring matches (with odds for TO (2.5) lower than 1.85). 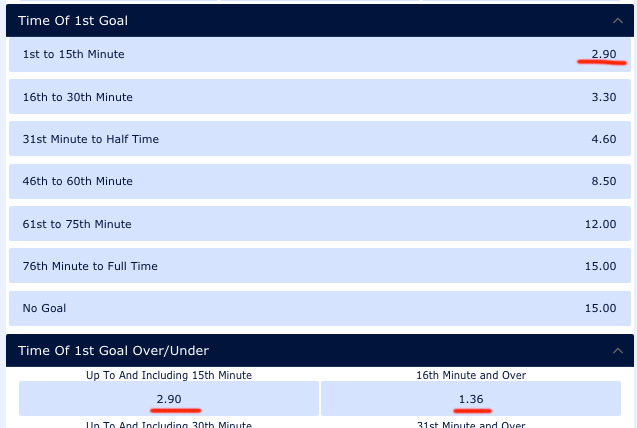 Do not bet on games with odds on no goals in the first 15 minutes higher than 1.35 (this means that bookmakers evaluate the probability of a goal in the first 15 minutes as higher than average). Pick matches between clubs, not national teams. Clubs tend to demonstrate much better team work — the make fewer mistakes and are more predictable. Simple calculations show that in the first 15 minutes 10,7% of all goals were scored which is not far from the authors’ figure (10%). So, by offering odds of 1.35 for no goals the bookmaker ‘says’ that the probability of a goal is 74%, while, according to the real statistics, it is 90%. A bet like this is classified as a value bet which, in theory, should let us be in the black. A lyrical digression: I may be paranoid, but I don’t believe in an absurd mistake like this. Especially made by not just one, but all the bookmakers. That said, you can use the strategy at your own risk, but do not forget to wisely manage your bankroll. Also of use may be martingale techniques. If you choose matches based on a thorough analysis of statistics and engage your intuition, the strategy may prove to be a successful one. According to the strategy, you need to choose 5 games and make 4 system bets (what do you mean ‘system bets’?) — one ‘2 out of 5’ bet and three ‘3 out of 5’ bets. There is only one requirement for choosing football matches — the odds on TO (2.5) should vary between 1.85 and 2.1. With this strategy, you make bets on TO plus insurance bets on evens (0-0, 2-0). The last 4th bet is directed against the main ‘enemy’ — the often-happening score of 1-0. At the first glance, the strategy may seem to be useful as it covers all possible outcomes of a match. One of the major downsides of the strategy is that it is really tough for beginners. It is indeed hard to predict the outcomes of 20 bets and keep a 20-cell matrix of various accumulator bets in your head. As a result, many players end up relying on luck. Let us perform a ‘light’ analysis of the strategy using random match outcomes and see what profit we can make here. Suppose, we have the following outcomes: 0-0, 0-1, 2-0, 3-0, 1-1. We place $100 on each system bet. The odds on each bet are 2.0. So, by betting 4*$100=$400, we won 80+40=$120. The net profit is: $120—$400р = —$380. Draw your own conclusions. We performed calculations using this Accumulator system betting calculator. Already our first test values showed contrary results. Which is not surprising, since, according to the probability laws, in the long run, the strategy is bound to fail (you can read more on the subject in the article about value betting). The strategy is based on the notion that bookmakers tend to underestimate odds for favorites and, consequently, overestimate them for underdogs. The reason for this is that most people prefer to bet on the stronger team. Bookmakers know about this tendency (which becomes more prominent by the beginning of the match) and try to balance the cash flows. All this leads to a situation when betting on the outsider against the favorite becomes profitable (‘value’) in the long run. The English Premiere League is considered to be the most suitable competition for this kind of bets. The strategy is rather popular on the internet and I am not sure why. You will understand my skepticism later. According to the strategy, you need to make a series of 6 bets only 2 of which have to win. As soon as your 2 bets win, you start a new series, irrespective of how many of the 6 bets you actually made. Let us see how it works on an example. Let’s assume that we have 740 dollars and the odds are always 2.0 (for simplicity). Now we should split the bank into 2 parts: 45% ($330) and 55% ($410). In this case, if our series of 6 bets loses, we will be able to start a new series. We make a bet in such a way as to ensure the winnings from each following bet equal the amount of the bet multiplied by the following numbers: 1, 2, 4, 6, 8, 12. In our case, this would be: $10, $20, $40, $60, $80, $120. $10 / (2-1) = $10 — the first bet, $20 / (2-1) = $20 — the second bet and so on. Total sum: 10+20+40+60+80+120 = $330 — the bankroll for the whole series. Now we can make any bets with odds no less than 2.0 until we have 2 wins in a series. According to the authors, if 2 out of your 6 bets win, you will be in the black. Note that these combinations make 1/3 of all the possible combinations. Why the authors of the ‘tried-and-true’ strategy keep their eyes closed to this obvious fact, I don’t know. By the way, if all 6 of the bets lose, you won’t be able to win your money back in the next series. Football bets on the exact score are considered to be tricky and risky. However, they do have one advantage — high odds. Since it is not wise to make a single bet on the exact score, bettors have come up with various exact score-based betting strategies. exclude matches with a high probability of one of the teams to win. The strategy looks attractive but let us look at the statistics. According to the statistics, the most popular scores are: 0-0, 1-0, 1-1, 2-1, 2-0. Approximately a half of all matches end with one of these scores. If we add here the scores of 0-1, 0-2, 1-2, we will have a total of 8 outcomes. On the net, you can also come across two more interesting strategies — the ‘Plus Minus One Goal’ strategy and the ‘Double’ strategy. Here you are supposed to pick four matches and predict the scores for them. Then, by adding and subtracting one goal from the number (in both directions), you get four more outcomes for each of the matches. In this way, you predict a total of 20 outcomes and use the results to make two-fold and three-fold accumulator bets, as well as single bets. The strategy reminds the ‘4 out of 5’ strategy described above, and I think that it has about the same success rate. The Double strategy is based on the notion that the most widely spread score is 1-0 for the home team. So, if you correctly pick 10 matches with a high probability of the outcome, and then, by using the ‘2 out of 10’ system correctly predict scores of two matches, you can earn profit. Mind that in this scenario the odds should be no less than 7. By the way, at the link below you can learn about one more interesting way to bet on the exact score. The strategies of betting on the exact score are quite interesting — they provide good scope for creativity. However, let’s not forget that bets of this kind are also complicated and risky. In some bookmaker lines, you will see offers of betting on an own goal scored in a football match (with odds typically being less than 1.05) and, vice versa, on no own goals scored (with odds higher than 10.0). An event like an own goal is no doubt difficult to predict. However, according to some bettors, there are factors that point to a higher probability of an own goal. As you can see, these factors are about the same that we consider when choosing matches to bet on TO. Which is only logical, as the more time teams spend on dangerous attacks at the opponents’ goals, the higher is the probability of an own goal. The last factor may be explained by the fact that the pressure of responsibility and high commitment to the desired outcome often lead to absurd mistakes, ridiculous bounces, etc. So, if you have to bet on own goals, it might be wise to make this bet a part of an accumulator bet. And even then, you are not guaranteed not to experience a situation like this. The description of the strategy can be found on the internet. However, we should note, that the system applies to financial management, that is, to the way you manage your bankroll. The idea is to use progression, which means that you will increase your bet by two units every time you win and decrease it by two units every time you lose. Each cycle should begin with 10 or 20 units. As soon you are in the black, the cycle is over and a new one begins. Let us look at the example below and see what your actions should be when using the strategy. Example: Suppose, our bankroll is 10,000 dollars, the amount of our first bet is 1% of the bank, that is, 100 dollars, the value of one unit as 5 dollars, and the starting point for the cycle as 20 units (100 dollars). So, we make bets on equally probable events with the odds of 1.95. If we made 6 regular flat bets, we would be in the red, as, to be in the black, the success rate for the odds of 1.95 must be no less than 100/1.95=51.28% (52 bets out of 100). As for the above strategy, we can afford the success rate of 50% (in our example, 3 out of our 6 bets won). To make the strategy still more efficient, you can use value bets, as well as have several betting series at once (I wouldn’t recommend it though, as no one knows how long losing streaks can last and if your bankroll will be enough to cover them all). Resume: the strategy reminds a safer version of martingale which helps prevent the ‘drainage’ of the bank. The idea is to make a series of bets on events with low odds. For example, if we bet 100 dollars with the odds of 1.1, and our bet wins, we get 110 dollars and bet this amount. And so on. Example: Betting on which team will have more corners in the first half. Variants: Team 1 or Team 2. The typical odds for this kind of bet vary between 1.1 and 1.2. With these odds, on the eighth step of the ladder, we will double our bank. Choose events whose outcomes you are certain about. Remember that one unlucky bet will collapse the whole ladder. Pick matches with odds varying between 1.1 and 1.2. If your bankroll is 1,000 dollars, you can split it into ten 100-dollar parts and have ten ‘ladders’ at the same time. With a ‘ladder’ of 7-8 steps and odds of 1.1, you will have to complete at least half of the steps, in order to stay in the black. From my personal experience, I would not recommend using this strategy, as, in the long run, it will inevitably land you in the red. (As to why, read above). Betting on even or odd number of goals is a variation of betting on totals. Question: Which score is more common in football — even or odd? Answer: Let’s think about it logically. Teams always start a game from an even total score of 0-0. If the match is important, every goal is highly significant, and the opponents prefer not to risk, the odds for an even score are typically lower. Otherwise, the outcomes are equally probable. To illustrate the point, here is a screenshot with odds on odd-even for the Confederations Cup matches. In this example, the second place in the group and reaching the semifinal are at stake. With regard to odd-even betting, we can single out two strategies that involve martingale and accumulators. The odd-even martingale betting strategy. You can chase odd-even bets either by halves or the whole matches. The strategy is based on the idea of a low probability of a long even or odd streak. Read more about it here: Martingale Bets on Odd/Even. Despite the name, the strategy relies on simple mathematical calculations rather than intuition. You are supposed to predict the possible outcome of the upcoming match by using statistical information about the ‘scoring potential’ of the teams provided by relevant services. Suppose, Zenit is a home team and Spartak is an away team. We take the average number of goals that Zenit scores when playing on the home field and add to it the average number of goals that Spartak misses on away fields. By dividing the resulting sum by two, we get the number of goals that Zenit, supposedly, may score in the upcoming match. By applying similar calculations, we can find out how many goals Spartak is likely to score, and therefore get an idea of the probable score of the match. Time to make a bet! 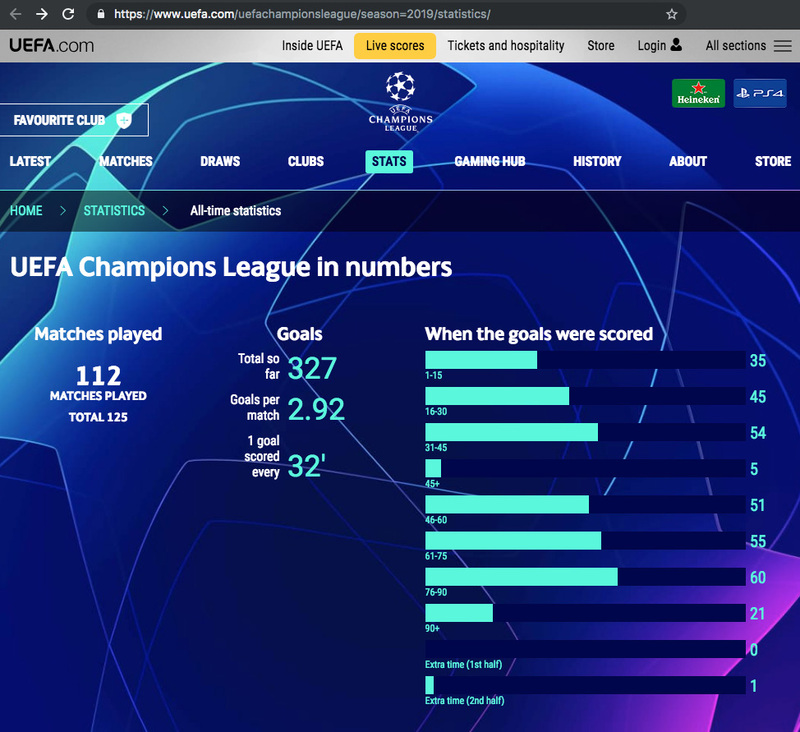 However, you can’t help wondering, why, if everything is that simple, bookmakers have not yet gone bankrupt… We have already tried to predict total goals in a match and you can read what the results were here: How to Predict Total Goals in Football. Unfortunately, double chance bets tend to have low odds. To increase odds, it makes sense to combine double chance bets into accumulators. In my opinion, in the long run, the strategy allows you to stay in the black only if you are skilled enough to analyze matches on a bookmaker level or make the same value or arbitrage bets as are described here: The 12 Betting Strategy in Football. Cash flow distribution, odds movement, steam moves — these are key notions every serious bettor should understand. Cash flows are the money invested in bets on event outcomes. From a bookmaker’s point of view, the ideal situation is one when everything is in balance and they steadily get their margin. If cash flows are not evenly distributed, the odds begin to shift. Normally, this is a gradual process, but there are situations when most of the money is bet on one and the same outcome. This phenomenon is called ‘steam moves’. It may occur spontaneously as a result of too many punters betting on the favorite or too much money being bet on one of the outcomes (by one person or a group). The reasons for this may vary and include a ‘weird’ match or some insider information. Steam moves often cause arbitrage situations. We have already talked about how arbs are formed and how bookmakers make profit from them in the article about arbitrage. There are different betting recommendations based on analyzing financial flows. The most general advice is to use dedicated online services and bet on the outcome chosen by the majority of bettors (typically, this would be the win of the favorite). As for me, I can hardly imagine how a tactic like this can turn out to be successful. There is also another, more interesting way to benefit from cash flow distribution. Here we need to mention the notion of ‘smart steam moves’ that occur when players make big bets because of a bookmaker’s mistake (a value bet) or some insider information not available to regular bettors. In these cases, odds can move drastically, and you need to be able make the right bet at the right time with the initial odds. The situation is short-lived since bookmakers exchange their information when they need to. Handicap offers include zero, positive and negative handicaps, as well as whole and fractional ones. By means of handicaps bookmakers expand your betting scope. If you are certain about the win of a team, but the odds for the outcome are too low, you can make a negative handicap bet like (-1) or (-2). Likewise, when a match promises to be a tough one, it makes sense to place a positive (outsider) handicap. The strategy is based on the corresponding type of betting offer which suggests that the ball will enter the goal of each team. In my opinion, this is not even a strategy as such. Although there is a lot of advice about how to bet with BTTS on the internet, all of it may be narrowed down to one main point: ‘Choose scoring matches and look at the statistics’. Unfortunately, bookmakers study statistics too, which is why scoring matches always have low odds. The idea is to pick a match with an obvious favorite and bet on their win in the second halftime. In this case, the odds will be higher than if you bet on the win in the whole match. According to statistics, most goals are scored in the second half. By this time, the teams have already learned about each other’s weaknesses and are ready for tougher actions, especially as this is the crucial halftime. If the favorite is winning, they are motivated to score more goals in the tournament by taking the advantage of playing with a clear outsider whose tactical mistakes they have already learned about in the first halftime. If the favorite is losing, they are obviously motivated to do their best to win. As for me, the authors do have a point, but the conclusions they make about betting on the second halftime being more beneficial than on the first are absurd. Naturally, odds would be higher where there is more risk involved. To this we can add that you should be careful when choosing a bookmaker for this kind of bet and pay attention to the rules of calculating yellow card totals. To illustrate the point, presented below are fragments of ‘yellow card’ rules of two famous bookmakers. First of all, let us clarify some terminology. The notion of cybersport stands for competitions between real teams and players simulated in computer games. The most popular of the games are: Dota 2, Counter-Strike, Starcraft 2 and the League of Legends, and bookmakers offer bets on them. FIFA 19 or newer are not as popular yet. Under ‘virtual sports’ (football, in our case) we mean computer-modelled, simulated real-life games without any real human presence. In fact, we are talking about a game machine that works in accordance with some algorithm (program) and models the game of two teams. Different bookmakers may use different programs like VFL (Virtual Football League) or the Champions League that is similar to FIFA except that, instead of real players, the opponent parties are computers. Bets of this kind are called bets on virtual (or cyber) football. 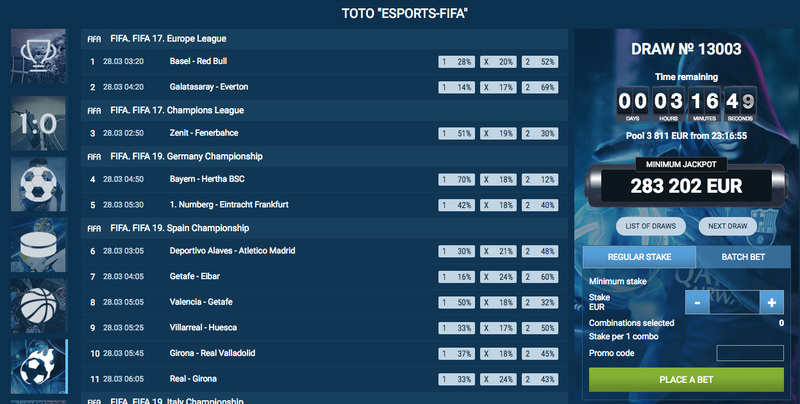 Some bookmakers offer bets on betting pools (toto) cyber football. About betting pools. the bookmaker margin is high.